Jarwil International takes pride in the experience and knowledge we can offer when it comes to moving traditionally ‘difficult’ consignments. Our expertise and worldwide network of equally experienced operators, allows Jarwil to manage your project cargo from origin to destination with a team of dedicated freight professionals committed to providing both cost and time efficient solutions to handling your project cargo. 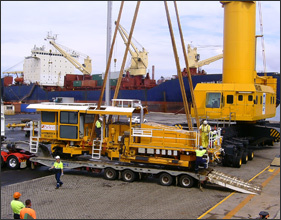 For more information about our Project Cargo expertise and some recent consignments, please click here to contact us.